Just wanted to thank everyone that stopped by our tables in Artist's Alley and the DC booth for commissions, sketches, and sketchbooks. Pictured above are myself, Allen Warner and JJ Kirby at the DC booth. Guess who's coming to WonderCon? 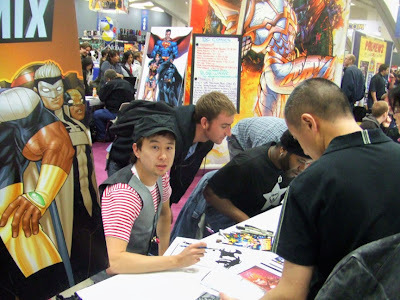 Jim Lee, JJ Kirby, Oliver Nome and Livio Ramondelli are all heading up to the City by the Bay this weekend! You can find us in Artist's Alley at AA101-103. Of course, Jim will also be appearing in so many different places at the con, you'll think we cloned him. 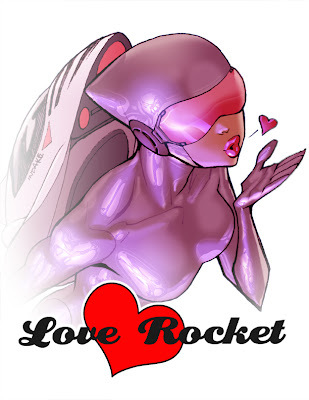 So keep an eagle-eye out for him throughout the con, especially at the DC booth, Artist's Alley and other panels too. Oh, and I almost forgot! The above image is Jim's variant cover to The New Dynamix #1 in stores March 5 written and drawn by Allen Warner and JJ Kirby, respectively. Can you guess which cover it also pays homage to? Hello again, here's the last cover of my Gen 13 run. 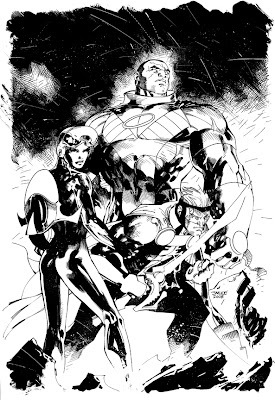 This is for issue #20 and we decided to go with a classic group shot for this one. I also wanted to do a little more detail on the figures, since the last couple covers were a little more graphic, I think. My favorite's probably the Rainmaker one, if I had to choose, but of course, I like 'em all! Hope you like it and see ya next time! Mike. 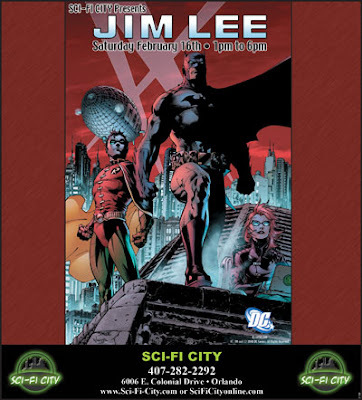 Jim's signing at Sci-Fi City in Orlando, FL today from 1:00pm - 6:00pm! Hello again, here is another commission I did, Mary Jane. I had seen her in books before, but it wasn't until an oversized Spider-Man comic, reprinting classic stories, that I first noticed her. This one had the first appearance of Mary Jane by John Romita Sr. and WOW!! 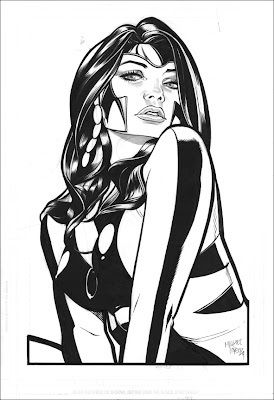 It was then that I realized that everyone had drawing her after John Romita Sr... was drawing her WRONG!! 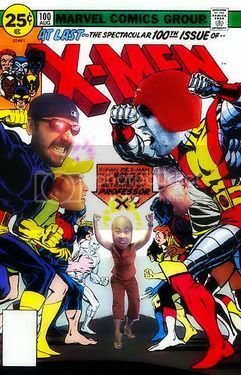 Maybe I am just too partial to classic comics and the original artist's take on them. 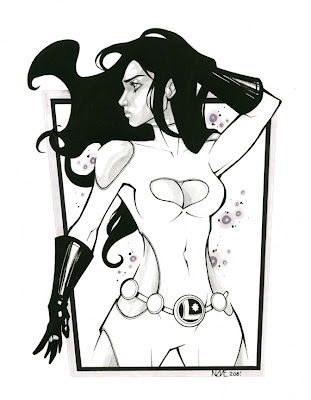 Anyway, Romita Sr. has always inspired me, and I think this commission reflects that inspiration. Hope you like it, see ya at Wondercon. Much of what I do here at WildStorm involves a fair share of digital work, so with this I really just wanted to go back to basics and do a pencil drawing. I have to admit that most of my love for the DC Universe comes from the genius of Bruce Timm. Darkseid is a character I always found visually striking but it really took the Superman Animated series for me to become interested in him. 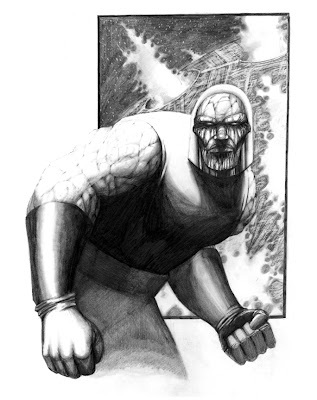 This is my first attempt at drawing Darkseid, and I was trying to go a bit away from the stoic, "arms crossed" pose he's frequently shown in. I was basically just trying to show him as a lumbering piece of living granite that had just turned his eyes toward a very unlucky enemy. It's always educational drawing a character for the first time, and even now I feel like I have a clearer understanding of how to better approach him next time. 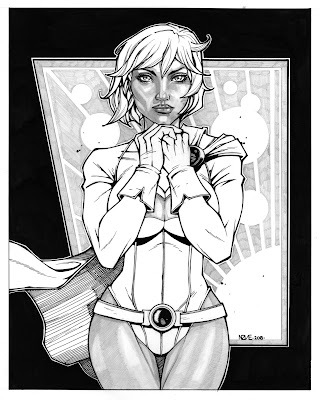 Hello everyone, here's a Powergirl piece I recently completed. 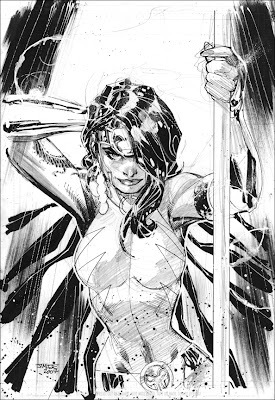 I actually did the layout right before Comic-Con in case someone wanted a commission of her. Surprisingly no one asked for Power Girl, but I just came across it recently and decided to complete it either way and I'm really happy with the finished piece. I'll have it along with other originals at WonderCon too. Can't wait! 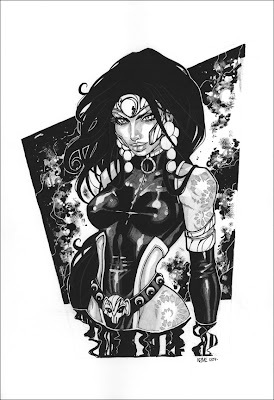 If any of you are going to the show, stop by and say "Hi" to the WildStorm crew. Cheers! 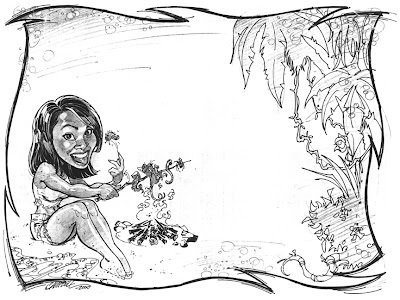 Jeff Campbell was kind enough to draw this on my application envelope to Survivor back when I first applied for the show. 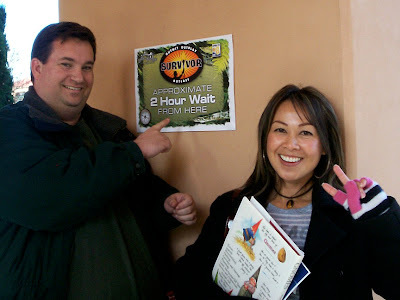 Eight years and five applications later, still nothing from Survivor's casting office. How can the Postal Service misplace so much mail? Ha, ha. Older and wiser, this year I went to the open casting in PERSON. A local TV station was there to shoot 2-minute videos for the first 500-ish applicants in line. Fortunately, I made the cut-off (Thanks to my friend, Michael, who picked me up at 6:15am that morning. See photo below.) After about 7 hours in line, it was finally my turn at the camera. I wish I could tell you that I was a superstar and knocked it out of the park. But sadly, nothing could be further from the truth. You wouldn't imagine that someone so tongue-tied could speak so fast. I don't think I even used up 45 seconds of my time. The military would be proud of me because all they got was name, rank and serial number. So, it doesn't look like I'll be taking any "extended leave of absences" from work anytime soon. Good thing I love my job. I feel like it was just yesterday when these were all drawn. Anyway, they've been quietly waiting in my office for the light of eBay and now, here they are! From top-to-bottom, we've got four original Voodoo pieces by Jim Lee, JJ Kirby, Michael Lopez and Oliver Nome. I think everyone did a great job on these and, as always, you can click on each for a larger view. Oh, and did I mention they're all up on eBay now too?